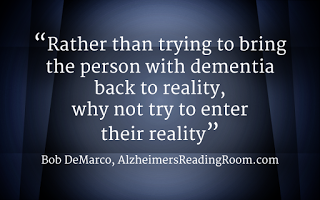 Rather than trying to bring the person with dementia back to reality, families and carers may try to enter their reality; building trust and empathy, and reducing anxiety. Rather than trying to bring the person with dementia back to reality, families and carers may try to enter their reality; building trust and empathy, and reducing anxiety. This is known as validation therapy but many families and carers will practice this technique without knowing its name. There is a link between the perception of time and memory function in those with dementia. Family members often report their loved ones with dementia sometimes live in the past, even reverting back to first languages. This is because memory is not just one process in the brain, but a collection of different systems. Those with Alzheimer’s disease may have impairments in short-term memory, however remote memory can be left relatively intact. So they’re able to remember public and personal events many decades ago, but unable to recall what happened earlier that day. Those diagnosed with dementia may underestimate time due to difficulties in recollecting all events in the short-term past, creating a feeling of a relative empty time travel. Someone without dementia may remember the boy cycling his bike, the yellow car parked next to the shop, the noisy lawn mower, and the couple playing tennis, on their walk to the bus stop; while someone with dementia is likely to remember fewer of these events, creating the sense that less has occurred and therefore less time has past. *** Trust the firm belief in the reliability and truth of someone. Trustworthy a person you can rely on; a person you have confidence in.